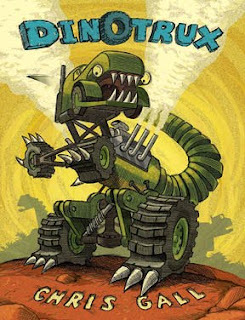 Dinotrux by Chris Gall. Little Brown. 2009. Review copy provided by publisher. The Plot: Dinosaurs that are trucks. Or is it trucks that are dinosaurs? The Good: Combining two subjects beloved by many children: dinosaurs. trucks. Or Dinotrux. The front matter of the book provides us with helpful information about the illustrations: "The artwork for this was created using bearskins and stone knives." Vibrant, colorful illustrations show the dinotrux as they roamed the world 1,000,000 years ago. My favorite? "There goes Rollodon! He NEVER watches where he's going. Roll it out! Roll it out!" And as he rolls over a snake, you see a long snake now rolled flat. Yes, it's silly; but it's also fun. There's plenty provided for the adult reading this book to ham it up, from "roll it out!" to "hooooooonk" to "burp burp burp." What else? The endpapers cleverly match up the dinosaur with its matching dinotrux, such as the firesaurus and firetruck.